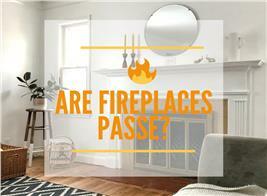 Are you ready for your dream home – or perhaps anxious to renovate and refurbish your existing one? Whether you’re building your own home – or having it built – or considering some needed updates, start your planning by going to open houses and scheduling a tour of model homes in your community. 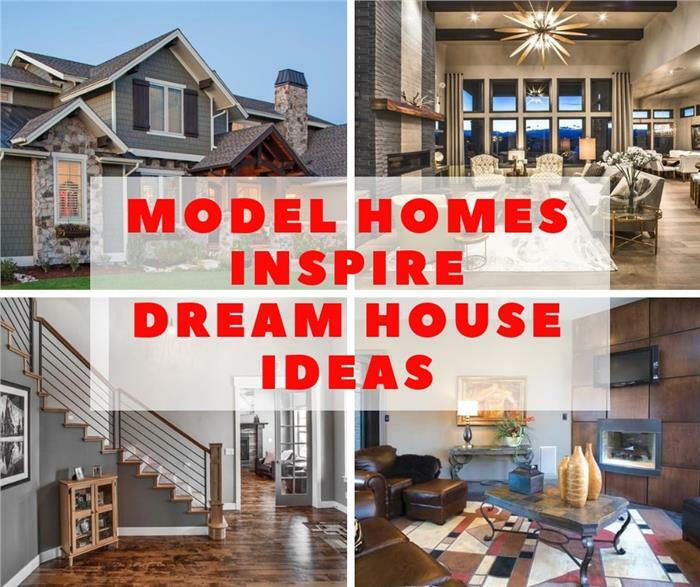 It’s an educational and informative way to see current home decor ideas, learn what’s important to you, and envision what you really want and need for your house design – including architectural style and fixtures. As you set out on this exciting adventure, let’s find out how you can apply house designs and interior design and décor ideas to create ambiance in your dream home or in a specific room. 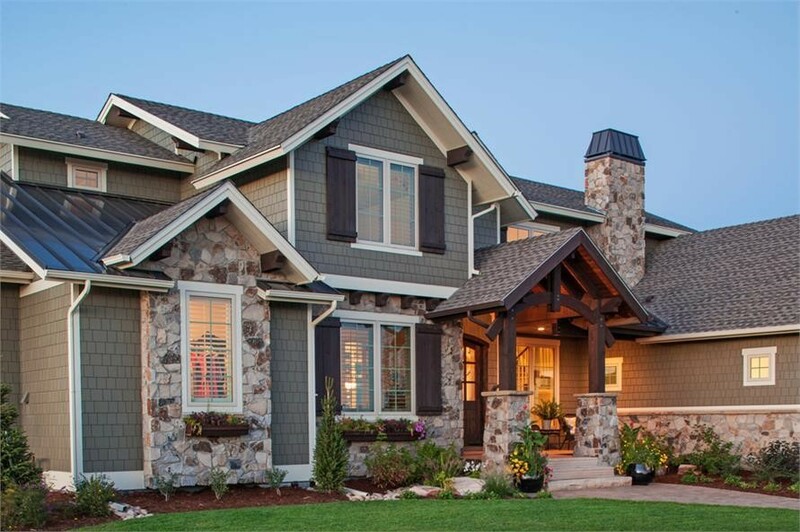 Does the Craftsman style speak to you? You may find a number of model homes like this delightful 2-story, 4-bedroom, 3.5-bath Craftsman home with vaulted ceilings – picked by TPC users as the most popular plan in our collection (Plan #161-1067). Picture yourself – like the nervous homeowners on Fixer-Upper – standing in front of their home as Chip and Joanna Gaines pull out the canvas for the big reveal – or as they enter the newly-renovated and redesigned home. There’s always a collective “wow” and amazement at these unveilings as they discover what lies behind the front door. Much like the homes on these shows, model residences have been professionally designed and staged to give potential home buyers an idea of what their homes can be – and how they can see themselves living in the space. Keep an open mind, and use your imagination as you walk through the home. And if at all possible, take a look at an empty model to see if it’s a fit for you, your family, your belongings and your lifestyle. 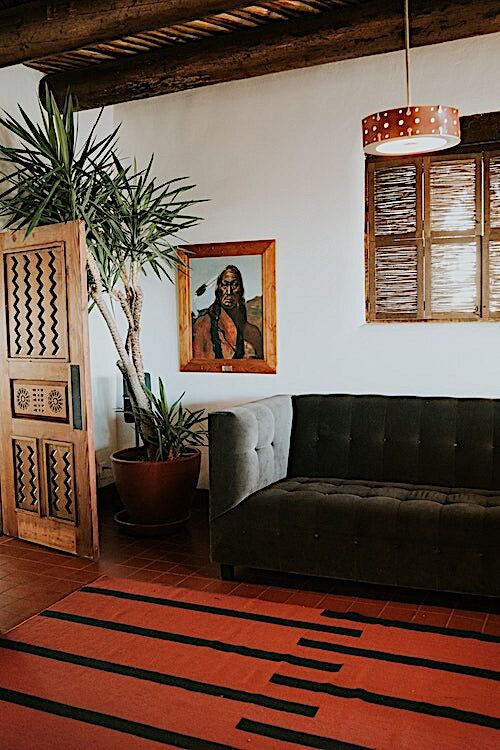 So what are the hot design trends behind the closed doors – and what can you “borrow” for your dream home or for a particular room in your current residence? Create atmosphere in a room with your color scheme. While you can go bold with paint colors, it doesn’t necessarily mean that the entire room has to be that one vibrant color. Use a vivid shade as an accent – but remember that your primary color scheme has to flow smoothly from room to room. Try painting exterior or interior doors and walls to add a splash of color and sparkle to the space. If painting is not your thing, there are other details to focus on. For example, when you walk through the model home, be sure to observe how colors and patterns are put together, and how furniture is organized to get a feel for what is comfortable and what may work in your home. Want to add a little curb appeal to your home? 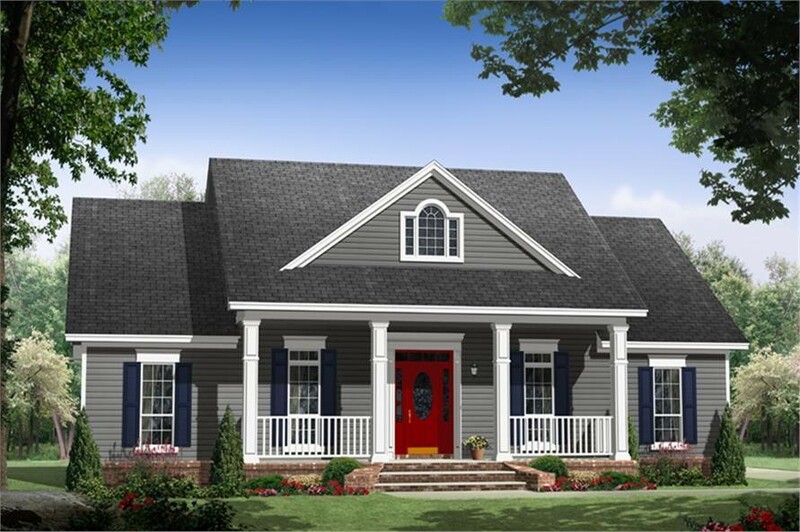 Why not paint your front door a bright red as this 1-story 3-bedroom, 2-bath Country style home (Plan #141-1243). Brighten up a room by featuring interesting and colorful artwork, wall hangings, window coverings, area rugs, and cushions that contrast with the wall color. 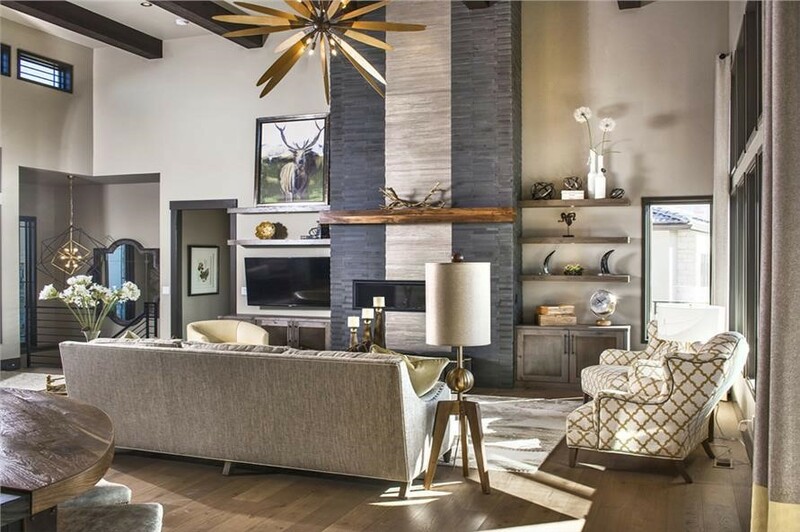 A smart use of color accents in this Hearth Room in a 3,374-sq.-ft., three-bedroom Contemporary style home gives it more oomph and pizzazz! 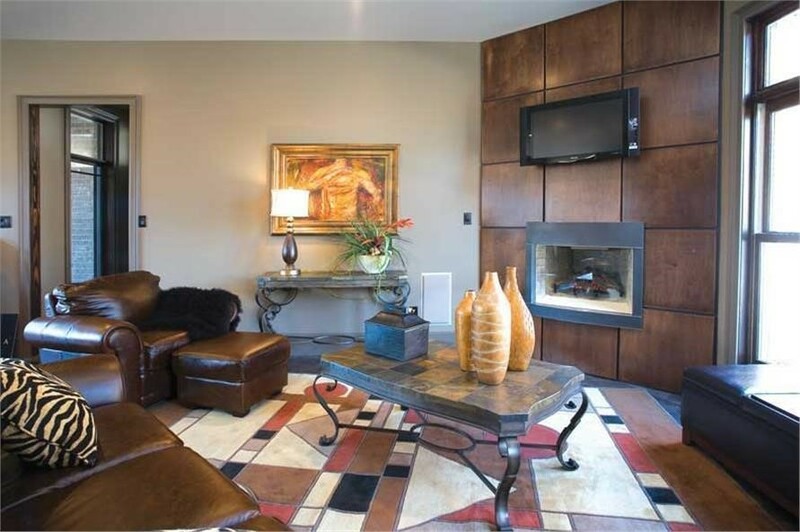 The beige tone is highighted by a dark-tiled accent wall, artwork, earthen jars, and geometric area (Plan #153-1808). Make a statement with a dramatic Great Room. Go from the mundane to a show-stopper Great Room with intriguing artwork, accessories, and a combination of the latest color trends in furniture and décor accents. At the same time, stick to clean lines and an uncluttered area. 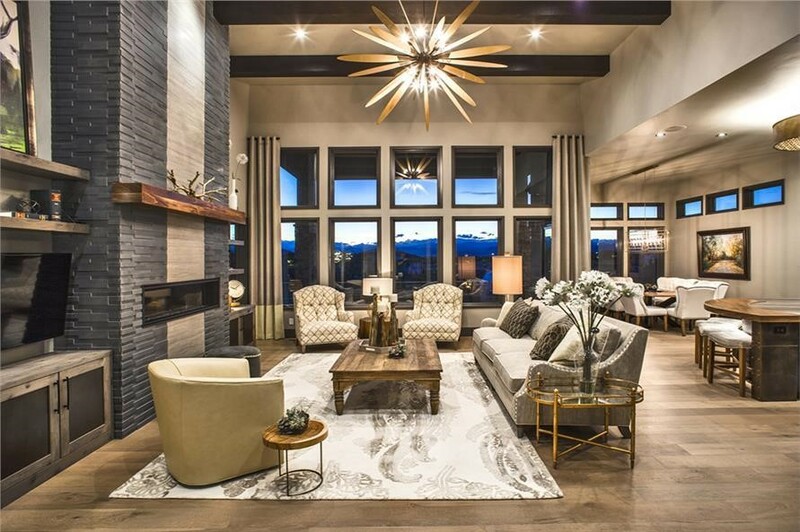 Top: High vaulted ceilings and a fascinating chandelier are the dramatic features of a Great Room in a 4-bedroom, 2593-sq.-ft. Contemporary style home. Throw in the accent wall, built-ins with art work, and the latest color and pattern trends in furniture – and you have one stunning space. Bottom: The trending “hot” colors – yellow, gray, and beige (according to designer Mary DeWalt) – are present in the Great Room’s furniture and color scheme: Let’s start with the light gray wall accented by the dark gray and white accent wall, gray area rug and couch, solid yellow chair at the left corner, and geometric-patterned chairs at the right corner (Plan #161-1085). Get some “redo” ideas from this gorgeous and timeless kitchen in a 3-bedroom, 3.5-bath Country style home that checks off a number of “trending” items in today’s kitchen. There’s no double-height island but one continuous lower countertop that’s comfortable for seating family and guests while at the same time allowing for more prep/work area when needed. The white cabinets are accentuated by black pulls; instead of baskets and ivy plants atop the kitchen cabinets, there are larger items for an uncluttered look (Plan #106-1274). With changes in the tile industry come opportunities for bathroom finishes. Instead of the standard 12x12 and 6x6 measurements, there are now tiles that come in different shapes, patterns, sizes, and color, including the large rectangular ones that are now used in some master baths. 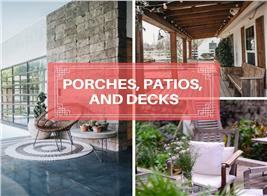 By mixing and matching tiles of different sizes and colors, you can create an attractive and modern oasis. 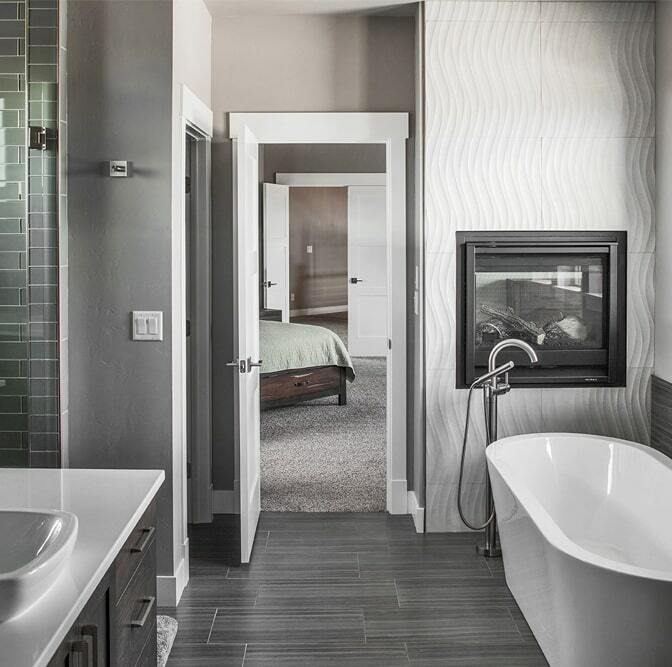 This master bathroom in a 2-story, 3-bedroom Contemporary style home uses large gray-and-white-patterned tiles on the floor and wall that complement the overall color scheme. Smaller rectangular tiles are the choice for the shower wall (Plan #161-1092). 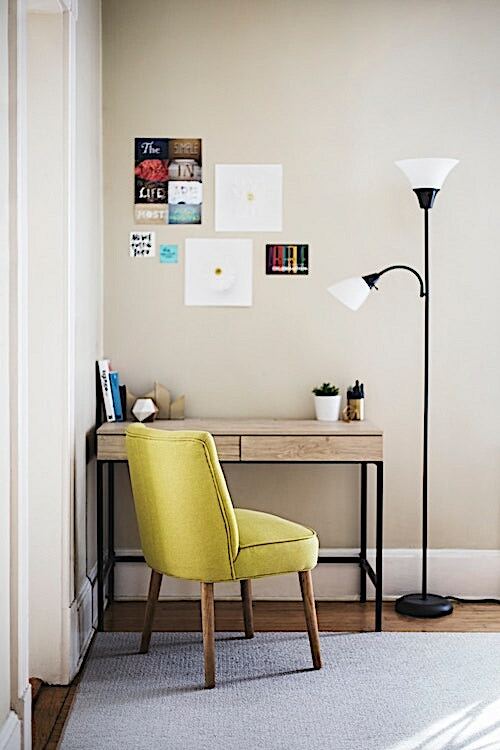 Learn to highlight small – and sometimes, awkward – spaces. In any home, there are spaces and corners that can be challenging to decorate. No homeowner likes a cluttered room – and on the other hand, a blank space is also disconcerting. 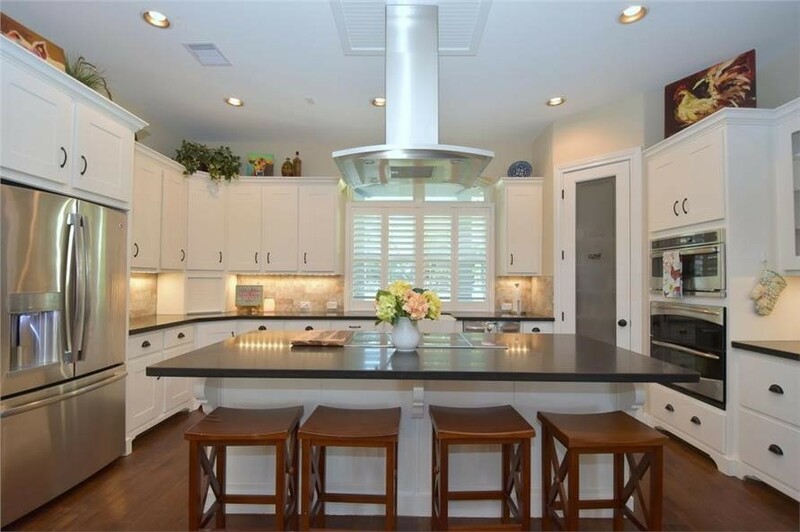 Here are a number of ideas on how to fill empty spaces in the home – that you may see when you tour model homes. 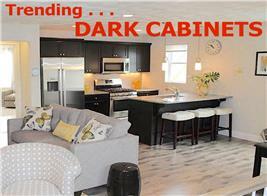 The first thing you see when you open the door of this 3,305-sq.-ft. 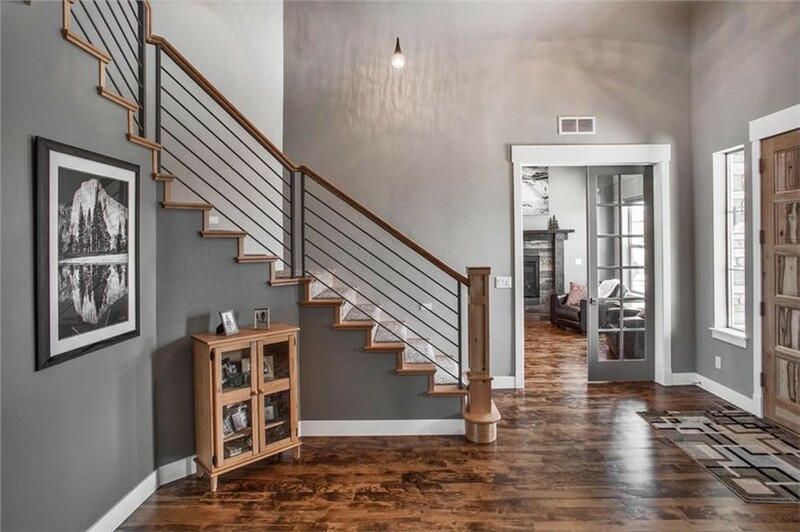 Contemporary home is an attractive foyer highlighted by a beautiful wooden staircase plus a curio cabinet and artwork that expertly fill the otherwise empty space to the left (Plan #161-1092). Blank Walls – Why not convert them into “exhibit” spaces for personal photos or art work? A fairly wide space between the window and door is now a display space for framed art (Photo: Sidney Pearce on Unsplash). Awkward Corners – These are not as difficult as they look. With a few touches, you can have a movable book shelf, a cozy sitting nook, or even a place for your Christmas tree. What to do with that tiny awkward space in the living room? How about a small office space (Photo: Kari Shea on Unsplash)? Whether you’re planning on designating flex space in your floor plan for guests or considering updating an existing guest room, pay close attention to the one in the model home. As in your kitchen, think simple, clean, bright, comfortable, and uncluttered. 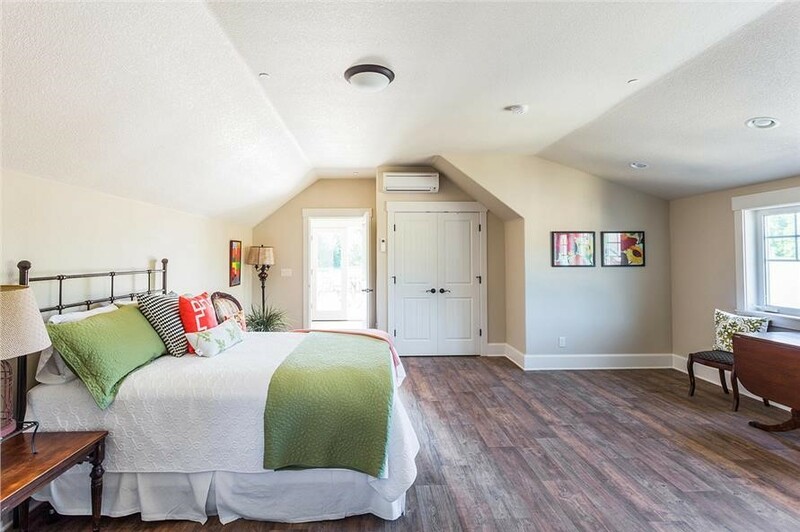 Any guest will love this spacious and homey bedroom in a 2-story, 3,815-sq.-ft. Craftsman style home. It’s simple, uncluttered, and bright, and has a huge bed with crisp linens and large windows (Plan #108-1789). Come up with a style balance for a kid’s bedroom. 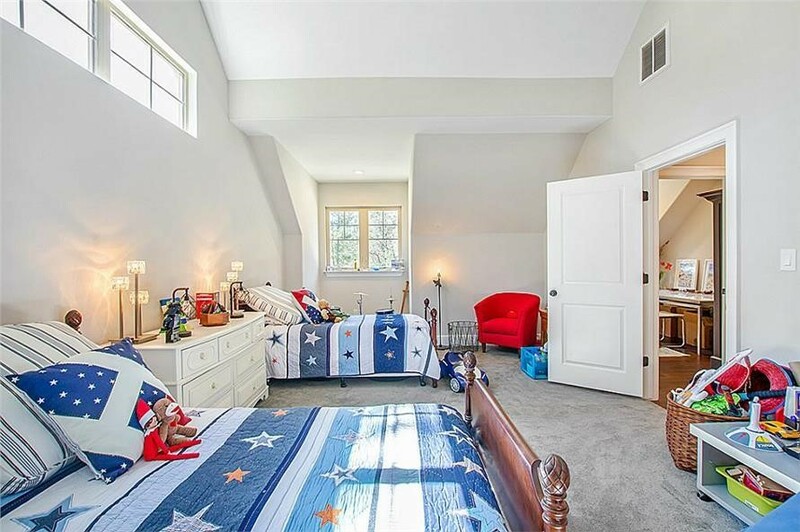 While you may have some specific ideas from all those HGTV shows about decorating a child’s bedroom, there can be additional information – and inspiration – from a model home. Whether the bedroom you’re thinking of renovating is a girl’s or boy’s, make it fun, exciting, and comfortable. Strike a balance between the whimsical and functional – by fashioning a place that reflects the child’s personality and interests; and at the same time providing the basics – shelves, bins, cabinets, desks – for them to get organized. This shared kid’s bedroom in a 2-story, 5-bedroom Country style home has whimsical and functional furnishings. The bedspreads, pillows and stuffed toys reflect the children’s interest. Keeping theme and décor simple makes it easy to modify the room once the children are older (Plan #153-1121). As you take that first step toward owning your home, be sure to keep an open mind. And at the same time, remember that the floor plans and designs of each model home must match your family’s needs, lifestyle, and preferences.